Click the pink “VIEW MY WORK” button below for password-protected portfolio and resume. and why you’re interested in collaborating. Heather offers a wide range of services for all your creative needs. From logo design to book layout to custom illustration requests — if you're not sure where to begin, Heather offers free 30-minute Catalyst Calls to help you find direction and inspiration for your next project. Thank you! You will receive an email within 24 hours with open time slots to choose from to schedule your appointment! Art-sploration Afternoons are super-fun art parties that ignite your child's imagination! Heather provides all the supplies you'll need to play, explore, and create with your child, all you need is a smock, some paper towels, and a playful heart! Heather works with children aged 3-7 years old. Depending on your child(ren)'s age and interests, Heather offers unique projects and creative games to unleash the inner artist that lives inside all of us! Parents and guardians are enthusiastically involved and engaged in all activities and projects; this not merely "creative babysitting", this is an opportunity to connect, bond, and expand your horizons with your children! We work in small groups up to 8 children, with a ratio of one adult per two children to provide personal attention and deep collective engagement. Children (and adults) are sorely deprived of playtime in general. Schools are cutting movement, music, and art courses from curriculum, so expressive outlets for kids lie outside of school, where they may or may not have access or exposure to creative play. 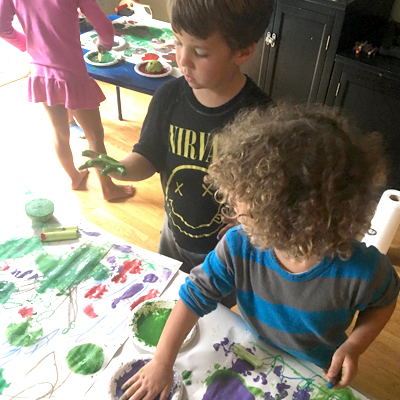 Art-sploration gives your child the opportunity to receive tailored support (in small groups or one-on-one settings) that nurtures their unique way of expressing themselves. 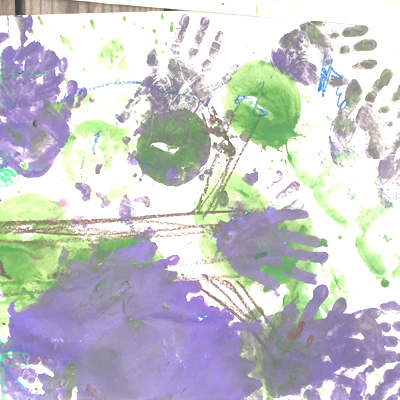 Art-sploration sessions increase communication and open a world of opportunity to create more space for creative expression, connection, and JOY between children and their caretakers. HOW CAN ART-SPLORATION BENEFIT YOUR CHILD? *Read more about the benefits of arts education for children here. HOW CAN ART-SPLORATION BENEFIT YOU? • The groups that received regular art classes were significantly more likely than were those that did not to have improved clinical outcomes, including better vital signs, diminished cortisol related to stress, and less medication needed to induce sleep. • It enhanced their self-worth and identity by providing them with opportunities to demonstrate continuity, challenge, and achievement. • It enabled them to maintain a social identity that resisted being defined by cancer. • It allowed them to express their feelings in a symbolic manner, especially during chemotherapy. Read more details of the study here. WEARABLE ART + ART PRINTS + MORE! Heather is a tiny-but-mighty lady living in Queens, NY. She is a Designer and Illustrator by trade and a dreamer and artist by birth. In addition to the healing power of art, she believes music and mindful movement contain the answers to all of life's problems. She infuses her creative endeavors with her experience and education as an AADP Certified Holistic Health Coach and Yoga Teacher, and encourages everyone to deeply connect with themselves and others, and most importantly, to PLAY!